If the target of this product is for professional use there needs to be not only an automatic timed backup feature but an ability for version or revision creation. IMO I don't think this is a core need. On my PC I use software called AJC Active Backup which keeps a catalogue of saved versions across my whole system. Its paid for software but I would recommend it. ... then the computer is configured to do auto-backups. MickRose mentioned one tool for Windows, macOS has one built-in for hourly auto-backups. 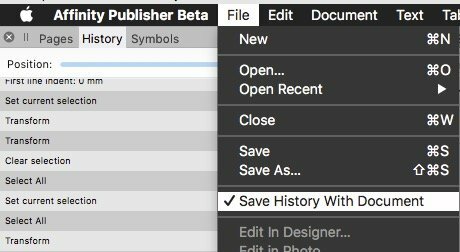 Activate "Save History With Document", then save. – In combination with "Save as..." you increase the ability.